Top: Sensitivity for discovering unknown mutations vs. backtracking known mutations with ultra-deep sequencing. Bottom: The rise of small TP53 mutated subclones after treatment; only single-cell analysis can elucidate whether all mutations belong to the same clone. Therapeutic failure in cancer is often associated with tumor heterogeneity and the natural selection of resistant clones, a mechanism shared by blood and solid malignancies. 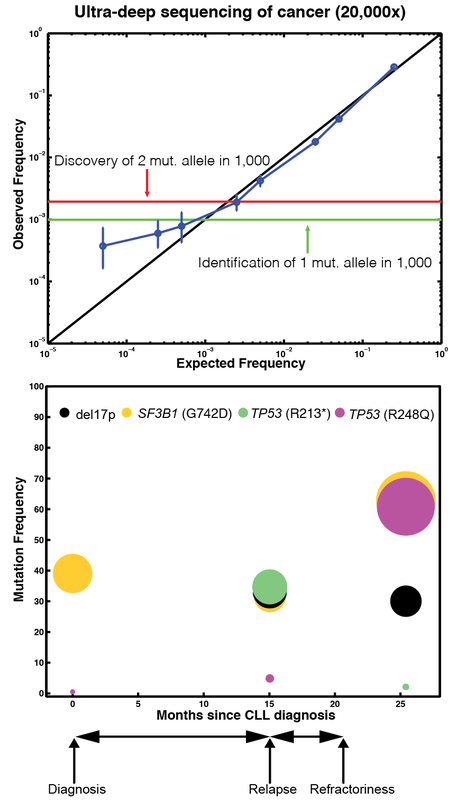 Recent studies strongly suggest that limiting the knowledge of tumor genetics to the dominant clone may be uninformative for an accurate prediction of outcome and optimal therapeutic decision; therefore, it is imperative to capture the distribution of mutants and the extent of genomic diversity in tumor sub-population structure. The goal of our lab, at Center for Systems and Computational Biology, is to identify markers of selection, study the impact of treatment strategies on tumor molecular history and time the rise of resistance in cancer. High-throughput genomics techniques facilitate rapid sequencing of patients and provide estimates of allele frequencies at each position, albeit with greater error and shorter reads than traditional sequencing methods. We have developed robust algorithms that model the background noise and establish depth thresholds to distinguish true variants from errors. We have applied these methodologies to investigate emerging infectious disease outbreaks, intra-host pathogen evolution, and unregulated cell growth in cancer. Our work has helped elucidating the mutational landscape of human neoplasms and the role of subclonal variants in disease transformation and relapse. In particular, the application of ultra-deep sequencing and statistical analysis to more than 300 newly diagnosed cases of chronic lymphocytic leukemia (CLL), the most common leukemia in adults, identified small mutations in the TP53, NOTCH1, SF3B1, and BIRC3 genes, four often-mutated drivers of this neoplasm. These mutations, present in 2 out of 1,000 wild type alleles, were missed by traditional Sanger sequencing. These TP53 mutated subclones identified before treatment became the predominant population at the time of disease relapse, and patients harboring them showed the same clinical phenotype and poor survival as patients carrying clonal TP53 lesions. Evolutionary patterns in cancer progression can be described through two models of growth. In linear evolution, genetic lesions of the dominant clone from an earlier phase are present in later phases. In contrast, dominant clones in branched evolution share only partial genetic alterations in different phases. Selective pressures can spur tumor evolution and change its mode of progression from linear to branched. 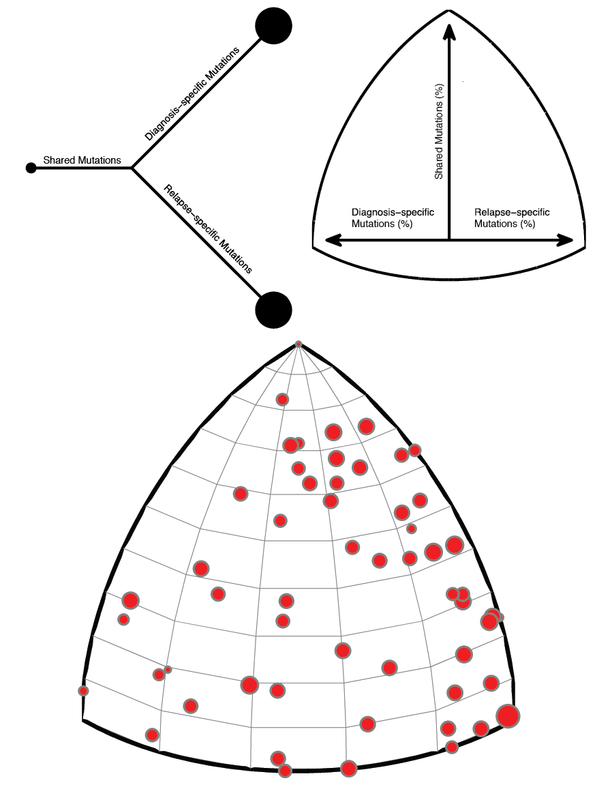 Molecular history of dominant clones in ALL from diagnosis to relapse as represented by phylogenetic trees; projection of these trees, shown as circles scaled by total number of mutations, indicate branched clonal evolution as the central mechanisms of disease progression. Cancer’s often-branched evolutionary process suggests that different approaches may be needed to evaluate and treat multiple aspects of disease. We have reported genomic evidence for branched evolution in disease transformation of CLL and follicular lymphoma to more aggressive malignancies. More recently, we investigated the clonal evolution of acute lymphoblastic leukemia (ALL), the most common neoplasm in children, from its initial diagnosis to relapse. Current therapy for ALL results in clinical and hematologic remission in over 90% of cases; however, despite intensive chemotherapy, 20% of pediatric patients and over 50% of adult patients with ALL do not achieve complete remission or relapse after intensified chemotherapy. Our whole-exome and whole-genome sequencing analyses showed that relapsed ALL originates primarily by branched evolution from ancestral subclones that are related to but are distinct from the leukemic population at diagnosis. In particular, we identified relapse-specific mutations in the NT5C2, KRAS, and NRAS genes, which we have shown to induce resistance to therapeutic regimens. In addition to studying the underlying genetics of cancer, we develop and implement computational approaches for analyzing precision-oncology data from high-depth DNA sequencing. These methods integrate genomic and clinical data to study the heterogeneous cancer cell populations within complex tumor microenvironments. We specifically study and quantify the enrichment of infiltrating non-tumor, hematopoietic cells that may harbor clonally expanded alterations due to an age-related condition known as clonal hematopoiesis of indeterminate potential (CHIP). The presence of these mutations confounds correct interpretation of patient genomic data, with direct implications for accurate diagnosis and disease management. We are now investigating whether CHIP clones exhibit distinct genomic landscapes when enriched in solid tumor microenvironment and are modeling their evolution under cancer treatment. To learn more about the lab, and employment and collaborative opportunities, please visit khiabanian-lab.org. 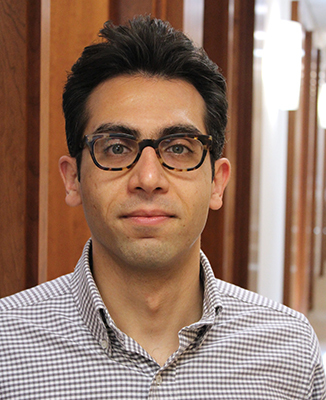 Dr. Hossein Khiabanian is an Assistant Professor of Pathology in Medical Informatics. He trained in physics and observational cosmology at Brown University, and prior to joining Rutgers, was a member of the Departments of Systems Biology and Biomedical Informatics at Columbia University. He is a member of the graduate faculties in the Department of Physics and Astronomy, the Institute for Quantitative Biomedicine, and the Microbiology and Molecular Genetics doctoral program at Rutgers University.